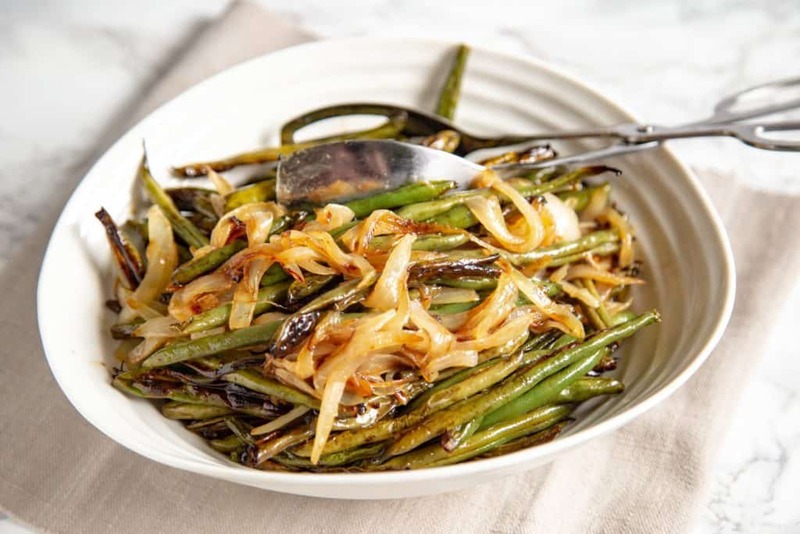 Oven-roasted green beans covered with beautifully caramelized onions. An easy side dish to make any meal special. My husband and I eat lots of veggies. On regular weeknights, we often just microwave those steamable frozen bags. Add a bit of salt and you have an edible side dish. But when I have time I love to roast vegetables. There’s something special about the flavor imparted by oven-roasting veggies. My favorites are butternut squash, brussels sprouts, and green beans. Add some caramelized onions and you have roasted vegetable perfection. 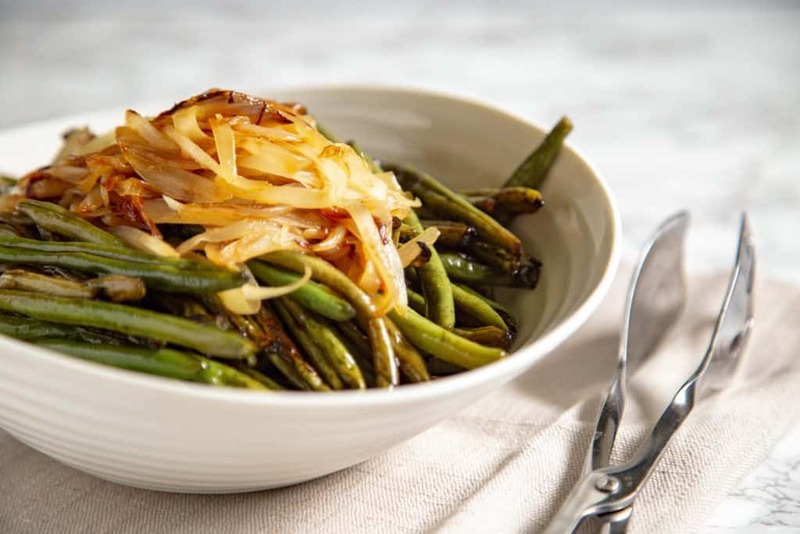 These green beans with caramelized onions would be perfect for Thanksgiving or Chrismas. But they’re also a wonderful side dish for any fall dinner. Start by preheating the oven to 425 degrees F. Then wash, trim, and dry the green beans. Place on a nonstick or foil-lined baking sheet and add olive oil and salt. Spread in an even layer and set aside. Then slice up the onions, melt the butter in a large skillet, and add the onions. Cook over medium heat until just softened (about 5 minutes), then turn the heat down a touch and cook for 40-50 minutes stirring every 5 minutes or so. If the edges start to get too brown and crispy, turn the heat down a bit. If pieces start sticking to the bottom of the pan, add a tablespoon of water and scrape up the burned bits. After the onions have been cooking over the lower heat for about 10 minutes, put the green beans in the oven. Bake for about 10 minutes, then remove the pan from the oven and stir up using a large spatula. Bake for about 10-15 more minutes until roasted to the desired doneness. Remove from the oven and set aside. 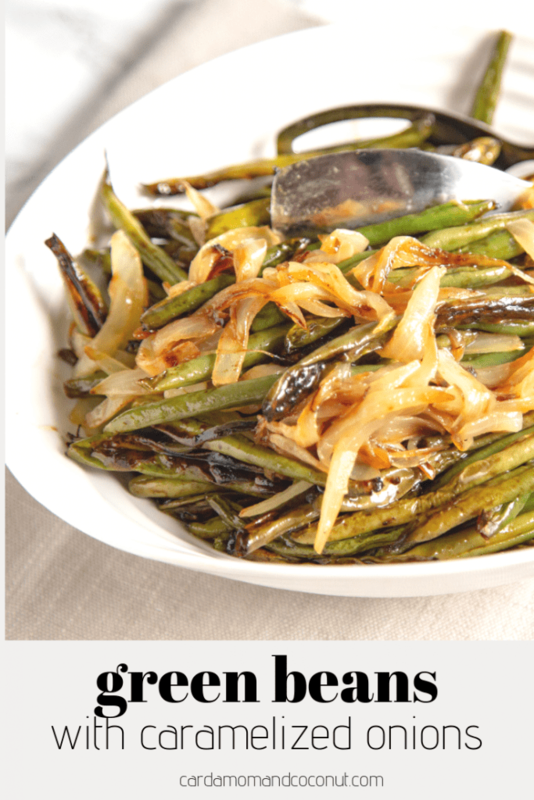 Serve the green beans with the onions on top, salting to taste. Looking for more recipes perfect for the holidays? Try this Butternut Squash Lasagna or Instant Pot Mac and Cheese. For sweet options, check out these Mini Caramel Apple Cheesecakes or this roundup of beautiful fall desserts. 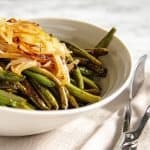 If you try this recipe for green beans with caramelized onions, leave a comment and review below and let me know how it worked out for you! Rinse and trim the green beans and dry thoroughly using paper towels. Line a baking sheet with foil. Add the green beans and drizzle with olive oil and salt. Spread out evenly on the pan and set aside. Slice the onions (1/4 to 1/8 inch thick). Then heat 2 tablespoons of butter in a large skillet over medium heat until the butter is melted. Add the onions and stir gently until just slightly softened (about 5 minutes). Turn the heat down slightly to medium to medium-low and continue to cook the onions, stirring every few minutes to keep them from sticking for about 40-50 minutes. If they’re getting too brown around the edges or are sticking, turn the heat down a bit. If pieces start to stick to the bottom, stir in a tablespoon or so of water to scrape up the cooked-on bits. After the onions have cooked for about 10 minutes on medium-low, put the green beans in the oven on the bottom rack. Cook for 10 minutes, then take out from the oven, stir around with a spatula, and bake for another 10-15 minutes until roasted to the desired doneness. Remove from the oven. Serve on a large plate with the caramelized onions sprinkled over the top. You can cook the onions several days ahead and store in an airtight container in the fridge. Heat with a tablespoon of butter in a skillet before serving. I just love this idea! So simple and I’ll bet tasty! This looks like a great way to liven up a vegetable side dish. You can’t go wrong with caramelised onions. I am in love with this recipe. I make it often too. Love that Caramelized onion in my mouth. How did you know that green beans are my favorite veggie! These look amazing! And I love caramelized onions. Side dish perfection! I am always on the search for new green bean ideas. This looks delicious and love the favor combination.